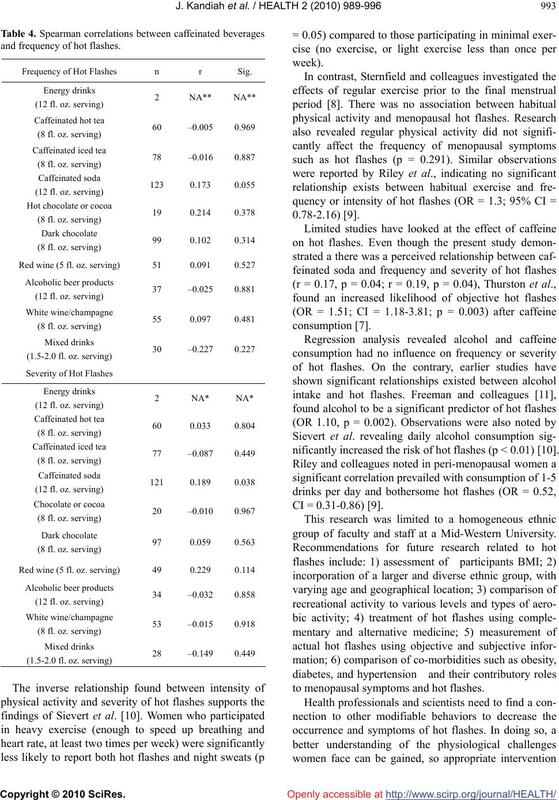 Received 30 May 2010; revised 25 June 2010; accepted 1 July 2010.
hot flashes (R2 = 0.043, F(6,184) = 1.39, p = 0.221). may predict severity of hot flashes in women. lead to fewer, less severe hot flashes. are a significant concern for women across the world. may be related to the diet and lifestyle of the area . of these factors to hot flashes. nism is not well understood, there is a prevailing theory. research has been completed on this factor . hot flashes in menopausal women. twice, with two weeks between each administration. low of 0.44 to 1.00, with a median coefficient of 0.77.
into subcategories based on usual number of servings. of aerobic (e.g. 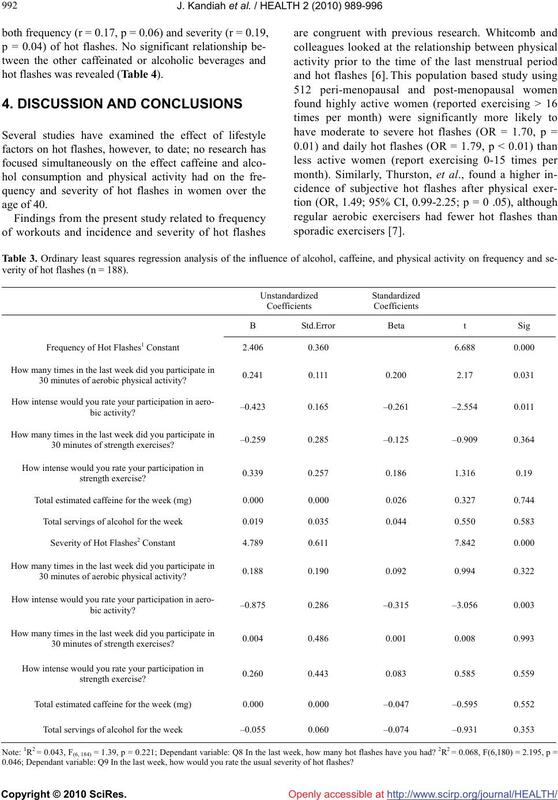 running) and strength activity (e.g. intensity (break a sweat, heart rate very increased). that may have interrupted daily activities) . used to evaluate frequency and severity of hot flashes. last week. 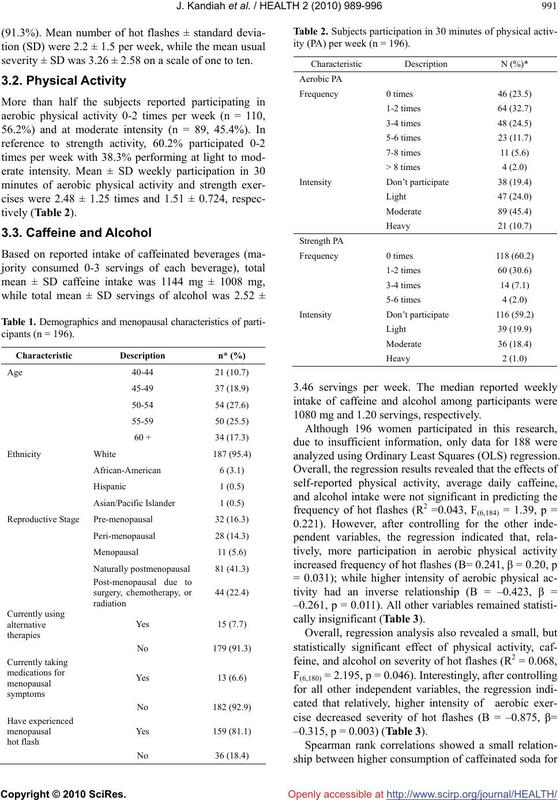 Significance was established at p < 0.05.
severity ± SD was 3.26 ± 2.58 on a scale of one to ten. ity (PA) per week (n = 196). 1080 mg and 1.20 servings, respectively. analyzed using Ordinary Least Squares (OLS) regression. –0.315, p = 0.003) (Table 3). hot flashes was revealed (Table 4). verity of hot flashes (n = 188). 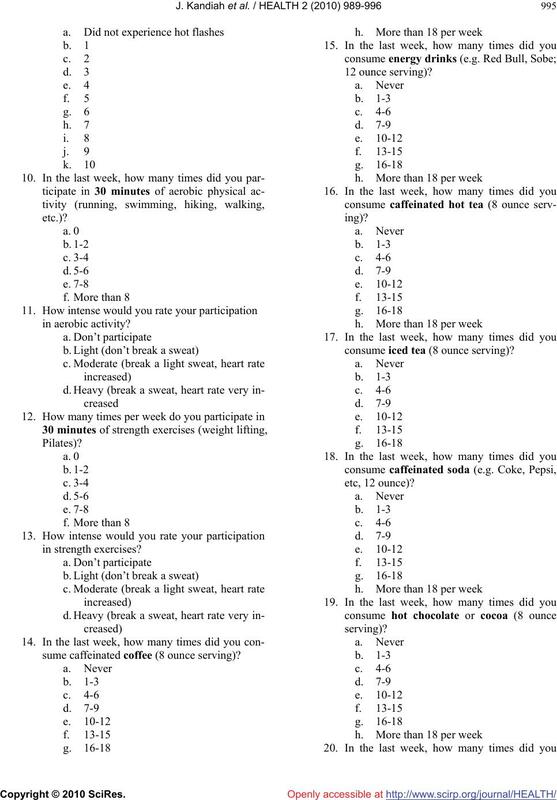 0.046; Dependant variable: Q9 In the last week, how would you rate the usual severity of hot flashes? and frequency of hot flashes. Frequency of Hot Flashes n r Sig. 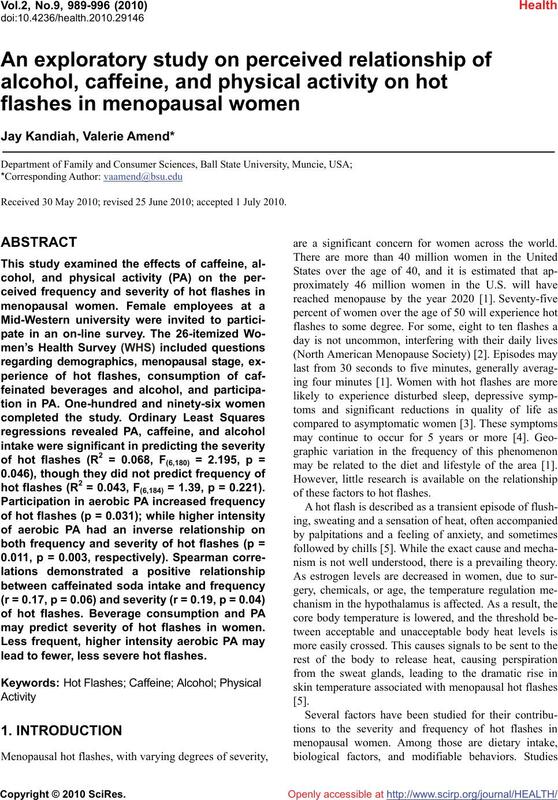 nificantly increased the risk of hot flashes (p < 0.01) . group of faculty and staff at a Mid-Western University. to menopausal symptoms and hot flashes. on alternative and complementary treatment approaches. Alternative Medicine Review, 8(3), 284-302. Position of the North American menopause society. Gynecology Clinics of North America, 29(3), 555-573. Anything new. 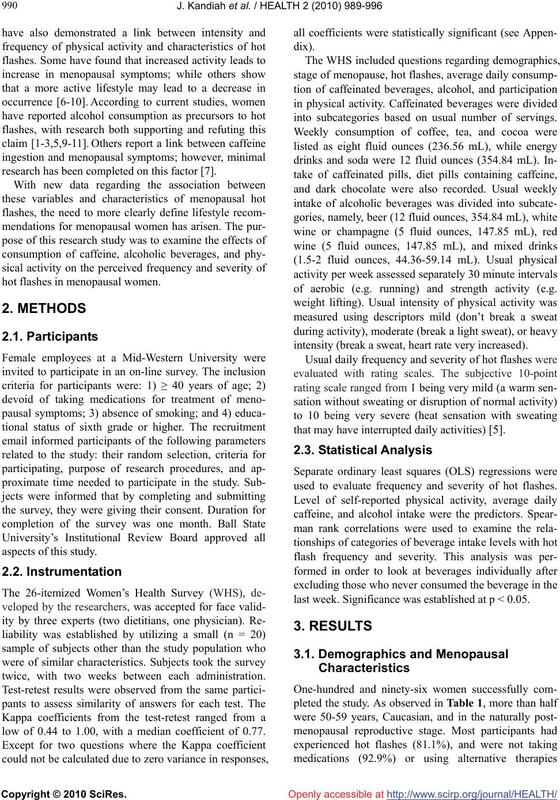 Maturitas, 60(1), 42-49.
of Women’s Health, 16(1), 124-133. Riley, E.H., Inui, T.S., Kleinman, K. and Connelly, M.T. 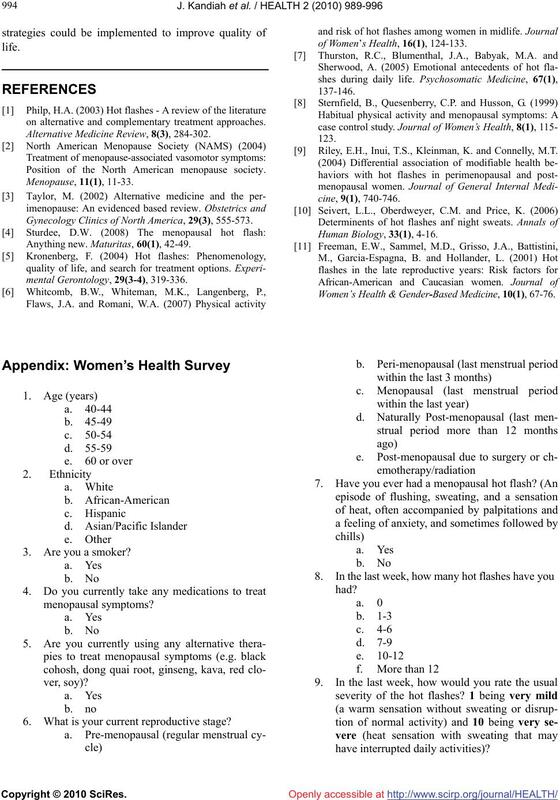 Women’s Health & Gender-Based Medicine, 10(1), 67-76. 6. What is your current reproductive stage? sume caffeinated coffee (8 ounce serving)? consume iced tea (8 ounce serving)? alcoholic beer products (12 ounce serving)? wine (not red; 5 ounce serving)? mixed drinks (1.5-2 ounce serving)?